This entry was posted in Music, Sociology, Theology, Worship and tagged church, hymns, index, meter, music, poetry, race, songwriting, worship, writing by davebarnhart. Bookmark the permalink. Hi, I just read your article and would like to comment. First of all, thanks for posting about meter reading. A lot of people don’t know what that is. However, I think you are being unfair. A LOT of the Chris Tomlin songs and David Crowder songs are very easy to sing. If you sing it once or twice, you will know it. 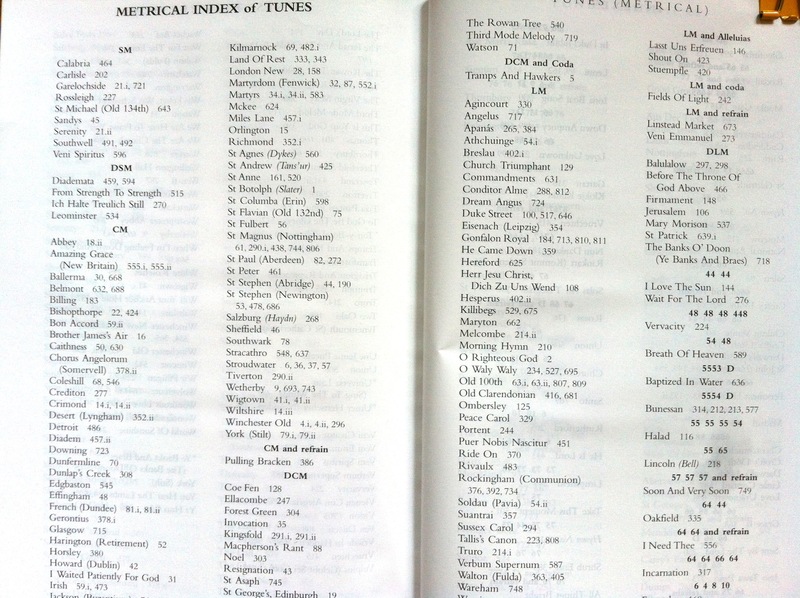 On the contrary, some of the old hymns have very complicated lyrics and difficult for people to understand. The goal is to glorify God and praise our Father with all our heart and all our soul. We can’t please everyone, but we are here to please God. More importantly, the songs must be God-Centered and not “Me” centered. There must be a balance in terms of old and new songs. I agree that SOME of the modern songs are difficult to sing, but so are a lot of the old hymns. For example, How Great is Our God by Chris Tomlin. How could you even think that this is difficult to sing? and the new David Crowder song, “After All (Holy)”, is just so easy to sing and memorable. This is not an issue with old is better new, but it reflects generation differences. Worship teams need to play both old and new songs, so that old people and young people will find a place where they can be spiritually connected and worship God with all of their heart and mind. i love writing music. i hate writing “praise and worship” music. i totally agree with everything you say here, but i just can’t do it without feeling like i’m coming across as cheesy or fake. so i don’t do it. that being said, i’d love to work WITH you, or whomever, to try and write some music for our community, from our community. Hi, Sonny – thanks! Yeah, I will confess to being unfair. I didn’t mention Stuart Townsend’s “In Christ Alone” (which sounds like a traditional hymn because it closely follows a meter), and I deliberately picked songs that illustrate my point. Kirk Franklin writes some songs with very irregular meters, and there are plenty of irregular songs that are worship classics. I also don’t mean to pit “old” against “new,” or “African-American” against “white” contemporary Christian music, because there plenty of counter-illustrations. But I think it’s safe to say that generally, white contemporary Christian music doesn’t groove. There are a lot of reasons people don’t sing. John Bell talks about a lot of them in his book “The Singing Thing” (http://www.amazon.com/The-Singing-Thing-Congregational-G5510/dp/1579991009). But I think a big one is that writers have stopped writing for congregational singing. They are thinking more about what will create an emotional high and not what will enable a community to sing together. I do agree that “you can’t please everyone” and that folks have different preferences, but I think people are more likely to sing if we write songs that are more easily singable. Casey – Let’s do it! Ted, I have to disagree that this is an issue about style, or that words are more important than, say, notes, rhythm, or meter. Why sing at all, then, if we can just recite a creed or catechism? Can’t music alone honor God? My beef is not with a style or genre of music, but with the fact that songwriters often neglect the fact that they are writing for a congregation. They do not consider how to include more people in the act of worship. To me, that’s as off-putting as the insider-language in traditional worship services. I don’t care for any of this so called contemporary worship. I say we stick with the old time hymns. Gregorian chants. Give me that old time diatonic scale, baby.